Pack away the pastels and summer basics — this season is all about embracing darker tones and lavish textures. From gothic leather and Shakespearean baroque pieces, to a revival of military detailing, this year’s fall trends will have something for every style. A cobalt dress from the Stella McCartney fall/winter 2012 show. Orange was a big colour trend earlier this year, but the cooler months will see an influx of vivid blues and reds in stores. Usually paired with black, blues were dominant on fall runways at the collections of DKNY and Stella McCartney. Cobalt, in particular, was a designer favourite. Easy to wear, blue tones also look great paired with silver for a chic, modern look. Reds were also a standout colour in the fall collections. From deep burgundy to bright scarlet, try incorporating this trend with a bold red coat or dress to add some flair to cold grey days. For dressier ensembles, go for the gold — a slew of metallic gold dresses were spotted at Elie Saab and Michael Kors. For the day-to-day, limit gold to accent pieces such as belts, bracelets, coat trimming or small detailing on a blouse. For celebratory soirees, take the look to full items and dazzle in a gold sequined jacket or skirt. Oxblood, a deep red, is another hot colour for fall. 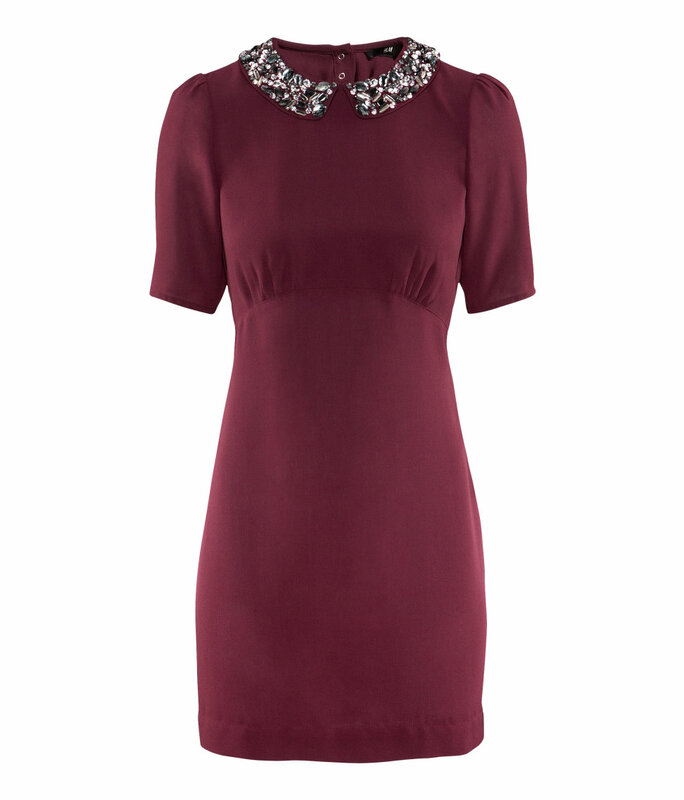 Find this dress with an embellished collar at H&M. In terms of texture, leather is always huge for fall. Whether it was because of the popularity of The Girl with the Dragon Tattoo or just a general moodiness in culture around the time designers were creating their collections, the tone translated into gothic leather pieces such as matte trench coats and embossed dresses. A highlight of the Proenza Schouler and Givenchy shows, leather has the capacity to be classic and rebellious depending on the fit, style and texture. Another trend similar to leather is the fascination with PVC and other waxy material. Channel Fendi’s futuristic take on PVC with a shiny black skirt made from the plastic textile. With its leather pants and black/blue combo, this ensemble from BCBG hits a few trends at once. For a more romantic and soft fall texture trend, look no further than velvet. The lustrous fabric is not just for holidays and kids under ten anymore, as evident on the runways of Gucci and Marc by Marc Jacobs. Try a velvet blazer in a jewel tone for a luxe look or a structured dress for that extra indulgence. Fur is always a big trend for autumn but this year, the material is kept more for small accents than a coat made completely of pelts. Whether you want to follow this trend with faux or authentic fur, find items such as a top with fur collar trim or a skirt with fur panelling. Military styling seems to return every few seasons and it’s back again this fall. Structured army jackets were prominent at Jason Wu and Tommy Hilfiger. Look for tops and coats with epaulettes, pockets and round, gold buttons. Baroque and Shakespearean influences were also featured heavily in the collections. Try this renaissance trend by sporting opulent pieces with heavy embellishments and intricate designs. Brocade, through the use of gold and metallic threads, is also characteristic of baroque style. A military-inspired coat from Zara. Pantsuits are another popular choice for this season. Go sleek and polished with a suit in a solid colour or, for the more adventurous, with matching patterns. Prada and Louis Vuitton both sent models down the runway with printed pantsuits. Try a jacket and pant combo in matching florals, tartans or checks. Oversized silhouettes, especially for coats, are also trendy. Look for roomy, slightly baggy coats that drape away from the body. Another trend that falls in line with the oversized look is exaggerated hips. Peplum is continuing strong from spring and summer, but for the daring there are dresses and tops with panniers — extra fabric that extends from the hips to give it extra oomph. Whatever style you’re drawn to, update your wardrobe with a few of this season’s trends. Fall and winter is always a fun time to play with fashion.